Children differ widely in how well they do at school. In recent years, researchers have shown that around two-thirds of differences in school achievement can be explained by differences in children’s genes. Genes have been shown to influence how well children do at primary school, at the end of compulsory education, and even in different subjects. But less is known about how genetic and environmental factors contribute to how well a child continues to do academically throughout their time at school. To study this, we used a sample of more than 6,000 pairs of twins who are part of the UK-representative Twins Early Development Study and analysed their test scores from primary school to the end of compulsory education. Our new research found that the twins’ educational achievement was remarkably stable: children who do well in primary school also tend to perform well in GCSE exams, which are taken at the end of compulsory education. Using twins allows us to estimate the proportion of differences that can be explained by genetic factors. Identical twins share 100% of their genes, while non-identical twins share on average 50% of the genes that differ between people, just like other siblings. If identical twins are more alike on a particular trait than non-identical twins, such as school achievement, we can infer that it is influenced by their genes. We can then estimate the heritability of that trait – or the proportion of differences that are down to the differences in children’s DNA sequence. In educational achievement – when grades in a standardised test remain similar between primary and secondary school. We found that about 70% of the stability in achievement is explained by genetic factors, while 25% is accounted for by the twins’ shared environment, such as growing up in the same family and attending the same school. The remaining 5% was explained by their non-shared environment, such as different friends or different teachers. When there was a change in educational achievement – where grades increased or dropped between primary and secondary school – we found this was largely explained by those environmental factors that are not shared by twins. 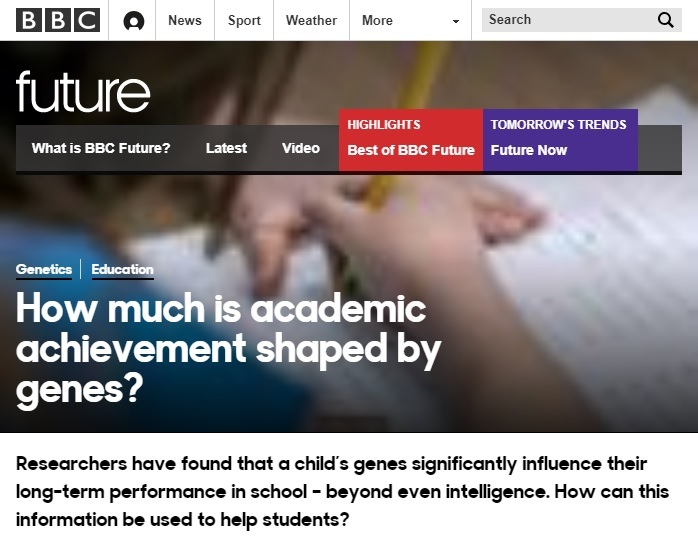 It’s reasonable to assume that this substantial influence of genes on the continuity of children’s achievement during their time at school can be explained by intelligence. But we found the influence of genes remained substantial – at 60% – even after accounting for intelligence, which was measured using several verbal and nonverbal tests taken by the twins over the course of childhood and adolescence. Scientists at the University of Edinburgh recently identified 538 genes linked to intelligence.